Arsenal close out a bizarre and distressing 2015/16 Premier League season with a home game against an Aston Villa side who were relegated approximately 57 years ago, or so it feels. Manchester United's loss to West Ham on Tuesday means that Arsenal cannot finish worse than fourth (it's a trophy!) while Sunderland's win over Everton on Wednesday means that St. Totteringham's Day is more unlikely than it could have been if Newcastle had something to play for. Arsenal will finish third with a draw or a win that isn't by 13 while Spurs get at least a point. They'll also finish third if Manchester City draw or lose to Swansea, regardless of their own result. Arsenal will finish fourth if they lose and Manchester City win. I don't have the exact percentages at this time of these potential outcomes. Before the midweek fixtures, it was 88% for third, 9% for second, and 3% for fourth, but I have to figure the odds of finishing second have dropped now that Newcastle have been officially relegated. All of that said, if Arsenal fail to beat an Aston Villa side that reached the beach ages ago, they really don't deserve to go right into the Champions League group stage, do they? It's devastating news again for Danny Welbeck, as the knee injury he suffered against Manchester City is much worse than it previously looked. He's needed surgery again and is expected to miss another nine months. It's terrible news for a man whose impact has been one of the few bright spots for Arsenal in the 2016 calendar year. If there's any good news, it's that it's not the same knee he injured last season, so there's no correlation between this injury and his last one. Alex Oxlade-Chamberlain is going to miss the Euros too after he picked up a new injury in training a few weeks back. We know Per Mertesacker's season has been over since he picked up a hamstring injury against Norwich. Mesut Ozil missed last week's trip to the Etihad with a hip injury, which means he can only return as far as the "doubts" column this time around. A few underused players got a run-out for the reserves earlier this week, which seemed kind of unfair since it was a promotion qualifier. Arsenal used the likes of Santi Cazorla, Francis Coquelin, Joel Campbell, and Calum Chambers to beat Aston Villa, 3-1. Predicted XI: Cech, Bellerin, Koscielny, Gabriel, Monreal, Elneny, Ramsey, Iwobi, Alexis, Ozil, Giroud. The only certain injury absence for Aston Villa is Jordan Amavi, whose season has long been over after an ACL injury. Jores Okore last month refused to play for caretaker manager Eric Black and is thus suspended by the team. Meanwhile, Gabriel Agbonlahor finds himself similarly banished to the reserves. Aly Cissokho returns from suspension after he was sent off against Watford for denying an obvious goal scoring opportunity, as Villa blew a 2-1 lead to lose 3-2. Predicted XI: Bunn, Bacuna, Lescott, Clark, Hutton, Cissokho, Gueye, Westwood, Sanchez, Gestede, Ayew. Arsenal's unbeaten run in the Premier League was extended to nine games with their 2-2 draw at Manchester City last weekend. You'd think a team on a nine game unbeaten run would be higher in the table, but five of those nine were draws. That's 10 dropped points in the past two months. Still, it's Arsenal's longest unbeaten sequence in the league since a 10-match unbeaten run (which included a much better nine wins) last spring. Arsenal currently sit on 68 points in the league table, their fewest since 2011 when they also finished with 68. They can surpass 2012's total of 70 with a win on Sunday. On February 6, Aston Villa beat Norwich 2-0. At that point, they were eight points back of safety with 13 games to play. The Villans then proceeded to lose 11 straight: 6-0 to Liverpool, 2-1 to Stoke, 3-1 to Everton, 4-0 to City, 2-0 to Spurs, 1-0 to Swansea, 4-0 to Chelsea, 2-1 to Bournemouth, 1-0 to United, 4-2 to Southampton, and 3-2 to Watford. They were officially relegated with the 1-0 loss at Old Trafford on April 16. Last week, the losing streak finally came to an end in dour fashion, as they played a 0-0 draw with Newcastle, which has now turned out to have been Newcastle's first foot in their own grave. So, Villa are now winless in 12, which is still only their second-longest winless run of the year after previously going 19 without a win. 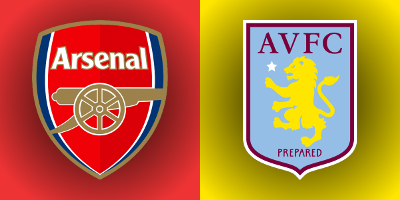 Arsenal won the reverse fixture comfortably back in December 2-0 at Villa Park. Olivier Giroud slotted home a penalty on eight minutes and Aaron Ramsey doubled the lead half an hour later. It would seem the from the recap that absolutely nothing else happened in that match, which is good, I suppose. There weren't even any bookings. Arsenal won all three meetings against Aston Villa last season, winning 3-0 at Villa Park, 5-0 at the Emirates, and 4-0 in the FA Cup Final. At the Emirates, in this corresponding fixture last year, Aston Villa had more than half of the possession, but generated only two shots on target. Arsenal led on eight minutes through Olivier Giroud but did not open the floodgates until near the hour mark. Mesut Ozil doubled Arsenal's lead in the 56th minute, Theo Walcott made it three in the 63rd, Santi Cazorla made it four from the penalty spot in the 75th, and Hector Bellerin opened his account to make it 5-0 in injury time. The Villans have just three wins in their last 36 matches against Arsenal across all competitions, but there is some cause for Arsenal concern: all three of those wins have come at the Emirates. Aston Villa's last goal against Arsenal came on January 13, 2014, when Christian Benteke pulled a goal back in the 76th minute in what went on to be a 2-1 Arsenal win. The referee is County Durham-based Mark Clattenburg. Clattenburg has a big summer ahead of him: not only will he be going to the Euros tournament in June, but he'll also be working next weekend's FA Cup Final as well as the Champions League Final the week after. Arsenal do not have a great record with Clattenburg this season; they lost 2-1 at the Hawthorns in November with Clattenburg in the middle (recall that he did give Arsenal a late penalty lifeline, which Santi Cazorla fired over the bar) and 1-0 to Chelsea in January, when Per Mertesacker was correctly sent off on 18 minutes. Arsenal did get a win with Clattenburg as the referee against Everton on March 19, 2-0. Over time, however, Arsenal's record with him is quite decent. Aston Villa have seen Clattenburg twice this season and, unbelievably, they won both. Aston Villa have won all of three games this season and yet they are 2-0 with Clattenburg. Those wins came against Bournemouth on August 8 and Crystal Palace on January 12, by the way. They suffered their aforementioned 19-match winless run in between. John Painting is a contributing writer to the Modern Gooner and a one-act opera written by Hector Berlioz. You can follow him on Twitter @zorrocat to critique the libretto.